Dymo Rhino 3/4" Vinyl Label Tape Cartridges are an extremely popular size and are compatible with most Rhino and RhinoPro industrial label makers. Following is the list of compatible Rhino label printers. These labels are the favorite! 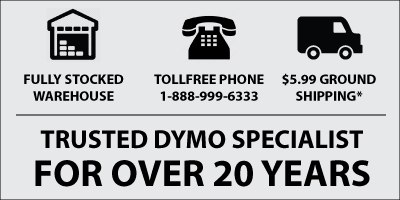 The Dymo Rhino vinyl label 's are the favorite of all our Tel/Data techs. No smear and stay on whatever they put them on. We have been using Dymo label makers and label tape for years. Every now and then a knockoff brand will send us a "comparable equivalent" but they never stand up to Dymo. Also Labelcity has the best prices and a top notch customer service department. I ordered 50 of the wrong cartridge (my mistake) and when I called and explained they took great care of me. Keep up the great work and you will retain customers. Preferred Labels for our company! These are now the preferred choice for our electricians. The have amazing stick ability and they do not smear! These labels are great. As soon as we order we get the labels in two days which we really like. They do not smear and stick great! !